To measure is to know. It is important measure your pet properly to ensure that you are buying the right size jacket, shirt or other wearable items. We are here to give you tips on how best to measure your pet. Use a measuring tape to make sure that your measurements are exact. To get optimal measurements, make sure your pet is stood upright on an even floor. A collar is an essential accessory for dogs and cats. To determine the right collar size for your pet, measure the circumference of their neck, but make sure that the collar has to be comfortable and not too tight. 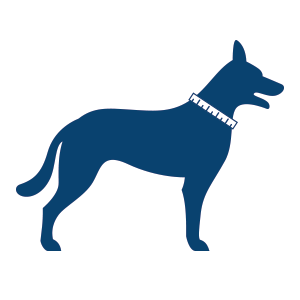 Ruffwear and Hurtta are popular dog collar brands. Use a measuring tape to measure the circumference of your pet’s neck. Make sure you measure the broadest part of the neck, close to the shoulders, as illustrated. A collar must be comfortable to wear at all times. Because of this, you should always place two fingers between the measuring tape and the neck when measuring the circumference. Doing this will help make sure that the collar you buy is not too tight. It is important for a harness or seat belt to be both a safe and comfortable item for your pet to wear. Wearing one of these items should not restrict their freedom of movement. For a harness such as those from Julius K9 or Thundershirt, it is important to measure the circumference of both your pet’s neck and their chest. For safety reasons, a harness is placed at a lower position on the neck than a collar. Place the measuring tape at the top of the sternum and direct it up, across the shoulder blades, to obtain measurements for a perfect fit. To measure the circumference of the chest, it is important to measure the broadest part, right behind the shoulders. A harness or seat belt must have a comfortable fit at all times. Because of this, you should always place two fingers between the measuring tape and chest when measuring the circumference. Doing this will help make sure that the harness you buy is not too tight. When shopping for a wearable item that covers a large amount of your pet’s fur/coat, it is important for the piece of clothing to feel like a second skin. Your pet should not be restricted in their freedom of movement when wearing the item. Please note that different items are made of different materials, some of which might be more stretchy than others. It is best to measure both the length of your pet’s back and the circumference of their chest when purchasing a coat or protective suit, such as those from Medical Pet Shirt. The length of your pet’s should be measured from the neck (withers) to the base of the tail. To measure this length, place the measuring tape at the withers (between the shoulder blades) and slide it down to the base of the tail (where the tail starts). 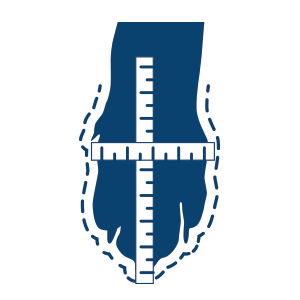 To measure your pet’s chest circumference, it is important to measure the broadest part of the chest, right behind the shoulders. Shoes or boots are particularly helpful for dogs that are suffering from a sore paw or other problems related to their paws. They also offer protection against different types of weather. When buying a dog shoe, it is best to measure both the length and the width of your pet’s paw. Place your dog’s front or back paw (depending on which one you want to buy the shoe for) on a white sheet of paper. It is important for your dog to stand in a stable, upright position. Please note: the measurements for the front and back paws may differ. Trace a line around the paw onto the piece of paper, or mark the front and back of the paws on the paper. Using the drawing, you will easily be able to measure the exact length and width of your pet’s paw. If you are unsure of which size you should buy for an accessory or wearable item and would like some advice, please do not hesitate to contact our Customer Service team. Reflects body heat for extra warmth. Specifically designed to protect damaged paws. Dog harness with a solid chest plate.